I know how sick you are. I know how hard it is. I know the crazy roller coaster ride you're on. I know how getting out of bed is more than you have energy for on many days. I know you push yourself to do even the simplest of things. I know you're investing everything you have, and even some of what you don't, to get well, feel better, and take your life back. I know you never imagined it would be like this. I know the obstacles seem insurmountable. I know people don't understand. I know the frustration of not being heard; of being dismissed, overlooked and misunderstood. I know the discouragement of doing everything right and still seeing little to no improvement. I know the ups and downs. I know the heartbreak and disappointment you've felt. I know the struggle. I know the mess. I believe what you say. I believe the unbelievable things you've been experiencing in your body. I believe how surreal it all is. I believe how very hard you work to get well. I believe how much you try to balance everything. I believe you try to be strong for your loved ones. I believe you're caring, competent and capable. I believe your ability to persevere through such extreme hardship speaks volumes about who you are. 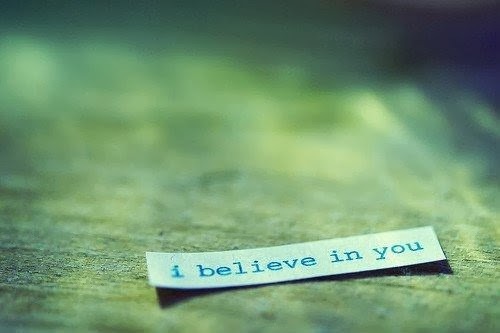 I believe you inspire others. I believe you are making a difference. I believe your story matters. I believe you will overcome this. I feel your inner struggle. I feel the burden you carry. I feel the aching and longing for change; for something lasting and better. I feel the deep seated determination you have to see this thing through. I feel the utter disbelief and outrage at the ignorance and insensitivity within certain aspects of the medical community. I feel your growing desire to escape it. I feel your drive to educate them. I feel your compassion and empathy for others who are also sick, in pain, and struggling with their own circumstances. I understand the depth of what you go through. I understand the undercurrent of emotions. I understand that you've lost so much along the way. I understand not everybody can see it. I understand how very different life is now. I understand your uncertainty. I understand those moments of despair. I understand the limitations and how frustrating they are. I understand the loneliness. I understand the brokenness. I understand the words that are often left unspoken. I understand the need for retreat. I understand how you want to get away but can't. I understand the times you need to be alone. I understand your silence. I really do. I understand the need for total diversion. I understand how getting out is not necessarily about physically feeling better but about doing something just for you. I understand your desire for simple joys. I see your true colors. I see what you go through. I see your resiliency. I see your courage. I see the love you lavish on other people. I see the hopes and dreams and wishes you still carry in your heart. I see the depth of wisdom and knowledge you've gleaned through the many long years of suffering. I see how you willingly share it. I see how you take the time to listen to others, even when you aren't feeling well yourself. I see that you're going through more than anybody else really knows. I see that you're hurting. I see how easy it would be to give up. I see how you've held on. I see how you've stood your ground. I see the deep faith that sustains you. I see, though your body is weary, just how very strong you really are. I hear your cries. I hear those held back tears you shed when no one else is around. I hear your heartfelt and gut wrenching prayers. I hear your prayers for others; how you ask God to help them hold on too. I hear your words of support and encouragement. I hear you cheering others on. I hear how you rejoice in another's health victory; how it's really a victory for all of us. Though buried beneath the exhaustion of illness, I still hear your passion for life. I hear the inner hope with which you speak. I hear your unique expression. I hear the truth of who you are. Michelle this is so beautiful. You brought tears to my eyes because you are so absolutely right. Thank you! This was wonderful to read today~ Thank you! Thank you! My niece has Lyme disease and I know this is spot on. I have to confess- I have continually come back to this and read it over and over in the last 24 hours. I have been in a definite struggle the past few days and this has been so encouraging. Once again thank you for your letter to all of us. It has meant a great deal to me. Ginny, Alyson, Heather, Missy and M - thank you, friends! We're all in this together. And Ginny, you can come back here and read this as often as you want. It touches my heart to know it has been an encouragement to you. Hoping and praying better days are soon ahead for each of us. I am in a much better place than the day I had read this but it still touches my heart so. Hope you are hanging in there. Thank you. I, too, have revisited this page numerous times. I have posted, reposted, emailed and shared this with so many people. I sincerely feel like you climbed right into my head & heart and pulled out my thoughts, fears, feelings and put them so eloquently into words. Thank you, you've no idea how much you have touched me with this. BK, your heartfelt words means more to me than I can tell you. Thank you. It really is the reason I wrote this; to try and put into words how we all feel and what we go through (although a blog post could never fully express the depth and magnitude of it). Thanks for taking the time to share your heart. Much love to you. During the past few months, we have had many new members visit our monthly lyme support group meetings. They have made such an impression on me because they are so sick and just beginning. Some with family members denying their illness. I kept praying and wondering how I could encourage them. As I was getting ready to leave for the meeting, your letter popped in to my head. I quickly printed it and shared it at the meeting. I did give credit to you, but I should have asked permission first. I hope that was ok. I had many people after the meeting thank me for sharing and say how it touched them also. I think of you often and hope you are doing well. Well Ginny, since we've already talked about this, I'll just post so everyone else will also know....Yes, it's perfectly ok. I want you to share it. If it speaks to you, please pass it on. Much love to you, my friend. Amazing. I too have read this over and over in just the last few minutes. I want to read it to everyone I know. You are amazing. This piece is amazing. Thank you for this. Lyme Whisperer, thank you so much for your kind words. It touches my heart to know it spoke to you. I was just on your fb page and so appreciate what you do to help support and encourage all of us affected by Lyme. You know all too well the depth of suffering it can bring, as does everyone whose commented on this post. Much love to you, my friend. STill touching my heart today! As you say, we are all here for each other. Much love, much support, glad to connect and stay connected! There are just not enough words to say how you have comforted, inspired and validated how I feel at this time-- thank you for putting a voice to my inner struggles, fears and hopes. May God bless you and may you continue to find strength and joy even in the midst of this battle- you are not alone. Angie, your words are very dear to me. I appreciate them so much. Thank you for taking the time to share your heart. And for encouraging me. Much love to you! this is simply stunning... your words... wow, arrow to the heart... a loving, caring, hopeful arrow. Janelle, that's exactly my intention; to speak love, hope and compassion. And truth. Love and hugs to you my sweet friend! Thank you for verbalizing our fight. You have put into words that which I try to explain to others when they ask - isn't there something they can do? Isn't it going to go away? Or does this ever go away? thank you for sharing your inspiration and your heartbreak. Thank you so much, amazon59. I hope and pray wellness for you; for us all. Much love and blessings to you! Thank you so much for this. It struck home and made me cry. Anonymous, thanks so much for sharing how you felt. Glad you stopped by. Praying better days for all of us. Blessings to you. This brought me to tears today. Thank you for saying what would be so nice to hear from so many people in my life. I have been fighting this for almost twenty years. As horrible as this disease is, it doesn't begin to compare with how painful it is when friends and family don't get it. It makes you wonder what these people think of you, that they would think you would choose this life. Just to read the words "I understand". Very powerful post...thank you again. Thank you so much for this. The support is incredible. I'm so sorry you are going through this terrible disease too. Thank you for writing these wonderful words of support. It means everything. Best to you Michelle. Reading this is now part of my nightly routine, and, each night, it brings tears to my eyes. Everything your wrote is spot on. Thank you for putting words to all of my swirling feelings. Thank you for validating that this IS difficult, and for the reminder that I can keep going.